Irish man Kevin Mallon, who was arrested in Brazil earlier this month over alleged illegal ticket sales at Rio 2016, has been released on bail. 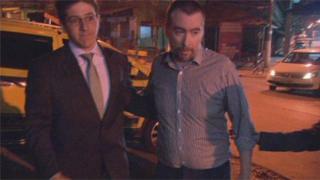 Mr Mallon, a Dublin-based director of THG Sports, was granted bail after a Supreme Court ruling in Brasilia. He was released from the maximum security Bangu 10 prison at about 22:00 local time (02:00 BST). Mr Mallon and his legal team left the prison without making any comment. Under his bail conditions, Mr Mallon must stay in Brazil and adhere to a 20:00 local time curfew. He must also inform authorities as to his whereabouts and is banned from all Olympic and Paralympic venues. Mr Mallon was also due to be electronically tagged. A court in Rio ruled it was not necessary after his release was delayed because of a lack of electronic ankle bracelets. The THG director was arrested on 5 August. Police said that more than 700 tickets, organised in envelopes and marked for sale, were found in a safe with him. THG, a corporate and sports hospitality group based in London, said Mr Mallon did not sell or seek to sell the tickets but was holding them for collection by clients of Pro 10 Management. Pro 10 are the authorised Irish ticket reseller. On Saturday, THG said it welcomed the news of Mr Mallon's bail and would work to secure his full release. It said it believes the company and its executives will be vindicated when all of the evidence is reviewed. It is believed Mr Mallon has been sharing a cell with former OCI president Pat Hickey in Bangu 10 prison. Mr Hickey, 71, has also been arrested in connection with illegal ticket sales. He denies any wrongdoing. On Friday, Irish foreign minister Charlie Flanagan agreed to meet with the family of Mr Hickey after they said they were "gravely concerned" about his health and his continued detention.